What we know as the New Testament – the Gospels of Matthew, Mark, Luke and John, the Acts of the Apostles, the Epistles, and the Book of Revelation – was actually born of thousands of texts and gospels circulated among the early Christians. If only there had been thousands of Christian texts and gospels circulating in the early centuries C.E., and if only we still had them! There were scores, certainly, and the number may have been as high as the low hundreds, but not thousands. Earlier obituaries etc. are here and links. UPDATE: It just gets worse. Mark has a new post up: Plagiarism in the Telegraph's obituary of Marvin Meyer. Epic fail. ELAINE PAGELS recently gave a seminar on the Book of Revelation for The Long Now Foundation. You can listen to it here: “The Truth About the Book of Revelations.” Obviously, the title should read "Revelation." MORE ON THE SYRIAN CRISIS: Jewish Aleppo, Lost Forever: The Syrian diaspora in Israel watches its once-vibrant ancestral home fall to ruin in the country’s civil war (Joseph Dana, Tablet Magazine). See also my recent post Syrian antiquities plundered. And there's much more on the Aleppo Codex here and links. The Dead Sea Scrolls and the mustache? We should note biblical text -- specifically the Dead Sea Scrolls -- which specifically state that "each time a mustache is shaved, an angel in heaven dies and falls to earth." Relayed on the PBS website by Paul Solman, who rightly has his doubts. It's a fine apocryphal saying, but it isn't in the Dead Sea Scrolls. The tanned, athletic man who wore rumpled khakis, oversized shirts and a silver hoop in his left ear "was our Indiana Jones," said James L. Doti, president of Chapman University in Orange, where Meyer held the Griset Chair in Bible and Christian Studies and was director of the Albert Schweitzer Institute. "Marv was a scholar and a showman who helped put this university on the map," Doti said. "He was fluent in 10 languages — five of them nearly extinct — and authored enough works to fill an entire bookcase. He was also a perpetually upbeat guy who inspired everyone he crossed paths with." Princeton historian Elaine Pagels, author of "The Gnostic Gospels," which in the 1970s ignited international interest in the sect of early Christians condemned as heretical, reflected the thoughts of many when she noted: "Marv was a pioneer in making available to a wide audience obscure texts from the first and second centuries that had been buried as heretical and rarely seen outside of academia." Other obituaries, etc. here and links. BEVERLY HILLS, CA.- A five-year run of silver shekels struck by Judaean rebels during the Jewish War against Rome, circa 66-70 AD, highlights the second half of the world-famous Shoshana Collection of Ancient Judaean Coins, offered by Heritage Auctions the evening of Wednesday, Sept. 5, during the Long Beach Coin & Collectibles show. The Jewish War section, lots 20105-20128, includes multiple examples of the silver shekels and half-shekels, dated Year 1 through Year 5, struck by Judaean forces engaged in a titanic struggle against the Roman Empire. The article has more details on the lot coming up for sale. As always, I encourage philanthropists to buy the best pieces and donate them to a museum. Failing that, please do make them available to scholars who want to study them and publish on them. It will only increase their value. Background on the first Shoshana Collection sale is here and links. THE DYBBUK (DIBBUK) LEGEND is featured in a new film: Sam Raimi’s latest horror flick draws on ‘true’ tale, Jewish exorcism (Naomi Pfefferman, Jewish Journal). “The Possession” — the latest riff on the subgenre of a girl defiled by a demon — revolves around a non-Jewish family whose 10-year-old daughter, Em (Natasha Calis), buys a wooden box inscribed with Hebrew warnings at an estate sale. The child immediately becomes obsessed with the box, carrying it around everywhere, as a feathery malevolent voice echoes through the house, lamps explode, the girl’s behavior grows increasingly agitated, and a claw-like hand emerges from her throat. Her divorced parents eventually turn to a Chasidic community in Brooklyn to arrange an exorcism, which is ultimately performed by the Jewish reggae star Matisyahu, in his first film role. Raimi co-wrote and directed 2009’s “Drag Me to Hell,” inspired by his mother’s childhood threat to him that should he misbehave, “our Aunt Minnie would put the evil eye on us,” he said. To write “The Possession,” he called on screenwriters Stiles White and Juliet Snowden, who had previously collaborated on “Boogeyman” (2005) for Raimi’s Ghost House Pictures. White and Snowden, who are not Jewish, immersed themselves in research to create the Jewish horror in the film, drawing on the seven years they lived in a Chasidic neighborhood in Hancock Park, watching the 1937 Yiddish film, “The Dibbuk” as well as YouTube videos of Jewish exorcisms, and reading works on Jewish folklore by authors such as Howard Schwartz. In a book about angels and demons, they learned of the Jewish entity, Abizou, the “taker of children,” who became the sinister spirit in the movie. “What is common in many possession stories is that knowing the demon’s name is crucial in order to ultimately vanquish it, so that became an important part of our mystery,” White said. More on the Dybbuk tradition here and links. NETWORKED DONKEYS at Kfar Kedem: Israeli biblical park outfits donkeys with Wi-Fi (AP). Some comment about Balaam seems called for here, but I'm not sure what. Background on Kfar Kedem is here. Palestinian Authority president says that unabated attacks "under the nose of the Israeli occupation authorities" seek to "rob Muslims and Christians of their holy shrines, destroy Al-Aqsa mosque and build the alleged Jewish Temple." A "series" of attacks on the Temple Mount "under the nose of the Israeli occupation authorities" seek "to rob Muslims and Christians of their holy shrines, destroy Al-Aqsa mosque and build the alleged Jewish Temple," according to Palestinian Authority President Mahmoud Abbas. In a statement issued to mark the 43rd anniversary of an arson attack on Al-Aqsa mosque in Jerusalem, Abbas said that the third holiest shrine in Islam is still under threat. His statement will be seen by some in Israel as denying any Jewish claim to the Temple Mount — the holiest site in Judaism. That's certainly what it sounds like. Does anyone know if the full speech or the full quotation in context is available anywhere? Reading in this allegorical fashion, Chiya argues that when the Bible says Benaiah struck down two men of Moab, it means that “he did not leave anyone comparable to himself [in scholarship], neither in the period of the First Temple nor in the period of the Second Temple.” When it says that he killed a lion in a pit on a winter day, this means that he immersed himself in a freezing pool, to purify himself before studying Torah. Alternatively, it means that he studied an entire treatise on the Book of Leviticus on a single freezing day. This remarkable transformation of Benaiah from a killer into a scholar raised two questions for me. First is the perhaps unanswerable one of how Chiya understood allegory. When he argues that the biblical descriptions of Benaiah’s physical feats were really descriptions of mental and spiritual feats, did he think that this meant that the physical feats did not happen at all? If so, how do the rabbis understand the entire David story, which plainly belongs to a world of fighting kings and their armies? If, on the other hand, Chiya understood that he was reading against the grain of the biblical text—that is, imposing on it a new meaning and a new system of values—the second question arises. How did he and his fellow rabbis think and feel about the enormous change in Jewish life that had made warrior-heroism so archaic and scholar-heroism so important? Clearly, between the time of the Israelites and the time of the Amoraim, there was a revolution in Jewish values, in which something was lost as well as gained. From a Zionist point of view, it’s even possible to feel that the denigration of Benaiah’s fighting spirit was a dangerous mistake for the Jews. Not until 1948 would the Jewish people once again produce warriors on Benaiah’s scale. Yet reading the Talmud has also made me more inclined than I used to be to see this question from the other side, from the rabbinic point of view. After all, if Torah study is the most worthy and most distinctively Jewish of human pursuits, then mere skill at fighting is negligible, a barbarism. Which, finally, does Judaism need more, warriors or scholars? Which is a higher human type? Clearly there's room for both. But one of the Talmud's important cultural innovations was to re-frame scholarship as an alpha-male activity. MORE ACCUSATIONS in the Jamal-Dominique Hopkins wrongful-dismissal complaint: Theological Professor Claims He Was Fired for Homosexuality Stance (The Christian Post). Rev. Jamal-Dominique Hopkins, an expert on the Dead Sea Scrolls, recently filed a complaint with the Equal Employment Opportunity Commission. Hopkins, 42, explained that the fallout started after a representative from InterVarsity Christian Fellowship spoke at an event he organized in February. Attendees were given a book that declared homosexuality was a sin. Following the event, Hopkins was confronted about the distribution of the book by his department chair, Rev. Margaret Aymer, according to reports from Religion News Service. NOT ANCIENT, but important and poignant Jewish archaeology: Israeli archaeologist digs into Nazi death camp (AP). Note also this report from 2004 of archaeological discoveries at Auschwitz. TEMPLE MOUNT WATCH: Abbas Derides Jewish Link to Temple Mount as ‘Fiction’ (Arutz Sheva). This quote is not inconsistent with views expressed in the past by the Palestinian Authority, e.g., here. UPDATE (23 August): More here. Marv brought the ancient world alive in his lucid and poetic translations and in his teaching both inside and outside the classroom, not only for students and colleagues but also for others around the globe. Beloved by his students, he was extremely generous with his time, working individually with them, taking groups to Egypt and teaching Greek and Coptic on top of his regular courses, and challenging students to think deeply about life’s meaning and purpose in his Schweitzer and Freshman Foundations courses. He was a true leader in challenging times and situations on campus, with a talent for putting people at ease and moderating between diverse constituencies, and he never shied away from such challenges. What many of us will always remember is Marv’s deep love of the Gnostic authors whose writings he helped bring out from the darkness, where they had long been dismissed as heretical. He invested decades in learning the languages so he could enable their ideas to speak in a way both fresh and true. Marv never sought fame, although it deservedly came to him — but he sought to bring ideas hidden by history into the open. If anyone ever loved learning for learning’s sake—utterly and unabashedly so–it was Marv Meyer. And he loved even more opening this astonishing world of ideas to his students who had never thought there was a gospel beyond the canonical four. Marv helped his students to see the world with different eyes, to see how exciting and fun it could be, and always, always to think about the ethical dimension of ideas. List Editor: "Mendelsohn, Adam D"
The Department of Religious Studies at the University of California, Davis announces a search for a tenure-track faculty position in late antique Judaism. Applicants must have strong research plans and teaching records, and expertise in Jewish texts from the late antique period, especially rabbinic literature. Applicants should be prepared to teach a broad range of introductory and advanced courses in Jewish Studies, to teach specialized courses at the graduate level, and to take an active role in UC Davis’ Jewish Studies Program. The program especially welcomes applicants with an interest in the historical, comparative and theoretical study of religion, as well as candidates with an interest in interdisciplinary work in areas already represented in the UC Davis Religious Studies program, particularly in the history of Christianity or Islam. Rank is assistant professor; Ph.D. in Religious Studies or related field must be completed by the start of classes, September 23, 2013. For full consideration applications should be received by October 15, 2012. The position is open until filled. It isn’t King Tut’s tomb, the Rosetta Stone or even the Ark of the Covenant or the Holy Grail. But what Frankfort native Matt Grey discovered on his summer vacation in Israel could provide significant insight into biblical and postbiblical life near the Sea of Galilee. Grey, a 1994 Lincoln-Way Central High School graduate and now assistant professor of ancient scripture at Brigham Young University, supervised an archaeology team this June in Huqoq that uncovered a rare mosaic floor in an ancient Jewish synagogue — a work of art that no one had seen for 1,500 years. The mosaic, made of high-quality stone cubes, depicts two female faces with a Hebrew or Aramaic inscription that refers to blessings on those who follow God’s commandments, Grey said. It was unearthed by Bryan Bozung, a BYU graduate who was one of many student volunteers on the dig. He had been hoeing in search of the floor when he scraped upon something. He immediately called over Grey and project leader Dr. Jodi Magness, of the University of North Carolina. As they gently cleared the area, faces emerged through the dirt. As they continued to clear the site, another scene became evident — depicting Samson placing torches between the tails of foxes as noted in the biblical Book of Judges. Only a few ancient synagogues were decorated with mosaic floors, even fewer had faces and fewer still featured biblical scenes. One of Samson is exceptionally rare. Read on for more about the excavator and the excavation. An interview with Bryan Bozung is noted here and that link also leads to lots of background links on the Samson mosaic. An archeological site, Khirbet Bad-Issa, in the West Bank city will only open to Haredi visitors. An archaeological site in the heart of the ultra-Orthodox West Bank city of Modi'in Ilit will be open only to Haredi visitors, says the city's mayor. The government is currently in the process of developing the site, which is believed to have been an agricultural village from the Second Temple period. It is now known as Khirbet Bad-Issa. The excavation persisted, however, and eventually revealed a farming village from the Second Temple period. In the center was a synagogue, which has since been partially restored. Also uncovered in the excavations was a winepress, a ritual bath, homes and large public and private buildings. A collection of 145 Roman coins from the first century C.E. was also found. I don't pretend to understand the ins and outs of Israeli archaeological politics, but I am surprised that this kind of limit can be enforced after Israeli taxpayers have put so much money into the site. I would want my money back! Whether or not this community has the technical legal right to exclude non-Haredi visitors, I contest their moral right to do so. As with all archaeology, these relics are the historical heritage not only of all Jews, but of all humanity, and should be treated as such. Mayor of mostly secular Modi'in threatens to close city park to ultra-Orthodox visitors if Modi'in Ilit doesn't reverse decision on national heritage site. Modi'in Ilit Mayor Yaakov Gutterman's statement that the archeological site in the city will only be open to ultra-Orthodox visitors is drawing fire from the neighboring city of Modi'in. Modi'in Mayor Haim Bibas threatened Tuesday morning to close his city's central park to ultra-Orthodox visitors if Gutterman doesn't take back his statement to the Haredi newspaper Yated Neeman. In a letter Bibas sent Gutterman Tuesday morning, he wrote: "National heritage sites are places central to the history of the Jewish people and should be open to everyone, whatever their worldview or religious affiliation may be." "As you know," Bibas wrote. "Two years ago, we inaugurated the Aneba Park in Modi'in – the city's central park. Since it opened, thousands of Modi'in Ilit-Kiryat Sefer residents have visited it, since your city doesn't provide adequate family recreation facilities. Up to now, I have refrained from discriminating between ultra-Orthodox and secular visitors, despite the multitude of petitions by Modi'in residents complaining that the park is being taken from them." Bibas finished his letter with a threat: "If the municipality you head doesn't reverse its decision and will in fact bar secular visitors, the city of Modi'in will bar residents of your municipality entrance to Aneba Park." This is developing into an interesting conversation. 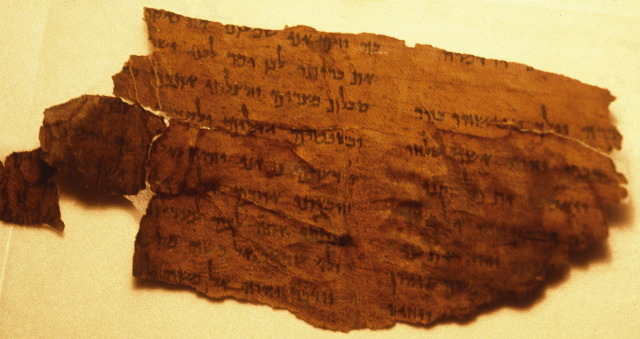 GEZA VERMES is interviewed on the BBC radio Heart and Soul program, in honor of the fiftieth anniversary of his English translation of the Dead Sea Scrolls. Fifty years ago this year, the first translations were made of the Dead Sea Scrolls, which have contributed massively to the understanding of the Bible and Christian teachings. The translations were done by a man who has gone on to be called the most important Jesus historian ever, Geza Vermes. John McCarthy meets Vermes, who has devoted his career to the historical examination of the Bible and the life of Jesus. Vermes tells McCarthy his own story of escaping Eastern Europe after his parents were killed in the Holocaust and how he became a Roman Catholic priest. He left the priesthood and his academic work has become the most-important academic study of the historical life of Christ, although many of his theories about the life and work of Jesus contradict the accepted teachings and beliefs that underpin the worship for hundreds of millions of people. McCarthy examines how his work contributed to the understanding of the Bible for ordinary worshippers, Christian and Jewish. Via Michael Bird at Euangelion. I fear that those outside the U.K. may not be able to access the file. AN OBITUARY FOR MARVIN MEYER, doubtless only the first of many, has been published in the Orange County Register: Noted biblical scholar, Chapman professor dies at 64. "If anyone ever loved learning for learning's sake — utterly and unabashedly so – it was Marv Meyer," Chapman University Chancellor Daniele Struppa said in an open letter to university students and faculty. "And he loved even more opening this astonishing world of ideas to his students who had never thought there was a gospel beyond the canonical four." Background here. Professor Meyer's name has been mentioned many times in PaleoJudaica, including here, here, here, here, here, and here. And for more on the debate over the interpretation of the Coptic Gospel of Judas, see here and links. UPDATE: Jared Calaway has a post at Antiquitopia which links to some blogger testimonials (including mine) and a 2010 interview with Marv: R.I.P. Marvin Meyer. Jason Ehrenkrook, Sculpting idolatry in Flavian Rome: (An)Iconic Rhetoric in the Writings of Flavius Josephus. Early Judaism and its literature, 33. Atlanta: Society of Biblical Literature, 2011. Pp. xiv, 226. ISBN 9781589836228. $29.95 (pb). “Thou shalt not make unto thee any graven image, or any likeness of any thing that is in heaven above, or that is in the earth beneath, or that is in the water under the earth,” declares the second commandment (Exodus 20:4, KJV). But how strictly did Hellenized Jews living in the Roman Empire interpret this commandment while living in a world saturated with statuary and artistic images? To what extent did their cultural milieu influence their interpretation of this commandment, and how did it affect their often uneasy interactions with their conquerors? These are the questions that Jason von Ehrenkrook approaches in this insightful revision of his University of Michigan dissertation, using Josephus, a Hellenized Jew turned distinguished Roman citizen, as his point of departure and main source of evidence for Jewish attitudes towards images during the Second Temple period.